(TibetanReview.net, Jul31, 2016) – China’s move to demolish something like half the number of the estimated 10,000 or so residences of monks and nuns at the Larung Gar Buddhist Academy in Serta (Chinese: Seda) County of Karze (Ganzi or Garze) Prefecture, Sichuan Province, has been continuing since Jul 20 without any resistance or protest from the affected community. 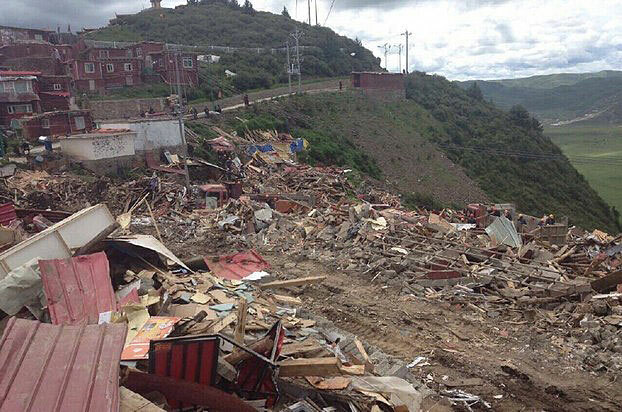 And Chinese work crews had been leveling from 100 to 250 structures a day, resulting in at least 600 dwellings having been already torn down, reported the Tibetan service of Radio Free Asia (Washington) Jul 29, citing local sources. The abbot of the academy, which is otherwise the world’s largest Buddhist study centre, had advised against holding of protests or online publicizing of the destruction following stern warnings from the Chinese authorities that such actions will result in arrests and even closing down of the academy. The plan is reported to be to demolish around 2,000 dwellings this year alone, with many more to be razed next year. The Chinese plan is to restrict the student strength at the academy to just 5,000, with the rest to be expelled. The academy, a centre for the study of ecumenical Tibetan Buddhism, has students not only from across the Tibetan Plateau but also from mainland China and Southeast Asian countries. It was founded in 1980 by the late religious teacher Khenpo Jigme Phuntsok with support from the former Panchen Lama. The academy was told that the order to trim down the complex and its student strength had come from Beijing, with President Xi Jinping taking a special interest in the matter. Although there have been no protests, the Chinese authorities are not taking any chances. The paramilitary People’s Armed Police Force has been stationed at the work site while warnings of arrest and imprisonment for any attempt at protest or resistance kept on being issued. The Larung Gar residents have been told that orders had been given to station 500 troops in neighbouring counties of Draggo (Luhuo), Tawu (Daofu), and Kardze (Ganzi) to suppress any protests or resistance.